Why replace it? We can repair it! Whether you rent an apartment or house in Louisville and need your carpet repaired in order to get your deposit back, or own a home in Louisville, or your commercial building has dangerous trip hazards in the carpet, there’s only one Louisville carpet repair company that will get the job done effectively, so you can worry about more important things. We are the Carpet Chemist and we’d love to help you with your carpet repair needs. For carpet repair Louisville, call us at (800) 515-1342. Our specially trained, IICRC-certified technicians repair damaged carpet at a fraction of the cost of replacement. Our clients generally save 60%-75% of the cost of replacement by having the Carpet Chemist repair their carpets. We’re MAD about carpets and love saving you money! Why replace it? We can repair it! We are Louisville’s trusted carpet repair experts. The Carpet Chemist’s scientific approach to cleaning and repair is based on our thorough knowledge of carpet and rug composition, construction and proper installation techniques. Our carpet repair technicians are highly trained professionals that have been through an extensive carpet repair training (or as we like to call it, Carpet Chemist School) and are knowledgeable and certified in the proper carpet repair procedures per the IICRC industry standard. All types of carpet from cut pile to Berber are used in the training classes so our technicians are able to tackle any carpet repair job, any size, any shape, any time! 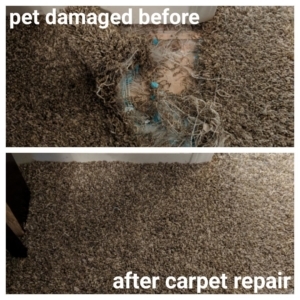 Some common Louisville carpet repair requests are for Berber carpet snags, iron burns, hookah burns, pet damaged carpet, paint spills on the carpet, and bleach spills on carpet, just to name a few. There is nothing you can do to your carpet that we cannot fix. Our clients rave about the professionalism, care, and quality workmanship that we put into each and every job. See for yourself! Do a quick Google search for Carpet Repair Near Me and click on The Carpet Chemist. OK enough about us, let’s get back to helping you with your carpet repair needs. Send us a pic of your damaged carpet in the contact form below, and get a FREE estimate in under 15 minutes! Carpet patching. A necessary repair when holes, burns, pet damage and untreatable stains ruin sections of your carpet. The damaged section is removed and a donor piece (a remnant or carpeting taken from a closet) is secured in its place. Seam repair. A latex adhesive is applied to reseal seams and restore a smooth, uninterrupted appearance. Carpet stretching. Power-stretching tools pull carpet taut; then it is trimmed and secured in place with tack strips. Damaged tack strips are replaced. Berber carpet repair. In small damaged areas, unraveled loops are woven back into position. Larger repairs require carpet patching. Transition replacement. Damaged transitions between carpet and other types of flooring are replaced and carpet edges are secured. Bleach spot repair. Lighter spots are color-matched and precision dyed to blend with the carpet. Stain removal. Carpet Chemist has a solution for any type of stain. When a stain is permanent, the damaged area is cut out and a donor patch is seamlessly installed. Water damage repair. High-powered extraction equipment and fans remove moisture. Then carpet is stretched and seams are re-bonded to restore carpet to original condition. Pet stain and odor elimination. Child and pet-friendly cleaning agents are used to neutralize odors and remove stains. Carpet re-dyeing. This is a cost-effective way to solve the problems of carpet or rug fading and discoloration. The Carpet Chemist uses propriety technology to achieve superior results. Apartment renters call the Carpet Chemist every single day. We can immediately tell by the frantic tone in their voice that they are extremely worried about not getting their deposit back, because their new cat Mittens, or bouncing carbohydrate of a puppy Barkley, dug a hole in the carpet and peed on the carpet in the corner! Don’t worry. We’ve got your back. You obviously won’t have an extra carpet remnant lying around for us to use as the donor piece. And you certainly don’t want to ask management if they have any. Heck, you might not even be allowed to have pets living in your apartment. It’s OK. We’re not going to tell on you. In fact, we carry extra carpet remnants of common colored carpet on our vehicles for this very reason. Since carpet rolls are made in dye lots, no two rolls of carpet will ever be the same exact color. They might be close, but never the same. So we will choose a closet,since a closet will be from the exact same roll of carpet as the rest of the apartment, and will find the most inconspicuous place, such as a corner, and cut out a section large enough to do the repair. Once the carpet repair is complete, we will use one of our non-matching pieces to fill in the corner of the closet. We have never heard of this being an issue with tenants getting their deposit back. Once the repairs are done, the carpet is ready for a deep steam cleaning which our technicians can provide right there on the spot. Your carpet repairs are guaranteed to be 100% permanent, so you don’t have to worry about the carpet steam cleaning pulling them up. All of our carpet repair work is backed by a 100% Unlimited Unconditional Lifetime Labor Guarantee. Louisville realtors and property management companies love The Carpet Chemist because we get carpets repaired, stretched, cleaned, and smelling great, without all the hassle and expense of purchasing brand new carpet. Whether you’re selling or buying a new home in Louisville, keeping costs down are imperative. If the carpet smells like dog, we will obliterate the odor and leave a soft pleasant clean scent behind. Pet urine in the carpet? We destroy odor causing bacteria in the urine salts by using a live enzyme solution accompanied with an oxidizing agent for double the odor killing power! Carpet waves and ripples? Pfft! Our mighty power stretcher tool will guarantee those ugly carpet buckles are gone forever! Berber carpet snag that got caught in the vacuum cleaner? Step aside, hideous carpet yarn that seems to only get bigger! The Carpet Chemist has the solution for that problem too. We’ll perform a seamless repair that will make it look like it never even happened. Bleach stains on carpet? We can dye that! Red wine or juice stains? We can make those disappear right before your very eyes. That’s right. There is nothing you can do to your carpet that we can’t fix! Find out what customers are saying about our cutting-edge process and five-star service!